So this is all about stars. At first I wanted to answer the comments individually, but there are just too many. Updates: There is a category that shows only installed items, here it’s easy to update individual ones. Applications will have the possibility to query for updates without invoking the gui at some point, probably not in the initial release though. Displaying the Rating of an item will most likely be the “five stars, just as in Nepomuk/Dolphin” variant. It shows the numerical rating in a tooltip (yeah, we all love numbers, don’t we?? though I would still download what I like, not what the rating tells me to like). I stretched the scale a bit, since ratings from 0-20 and 80-100 are nowhere to be seen. The user will be able to rate items, but only gets to choose “I like it” or “Don’t like it”, same as on openDesktop.org. The scrolling is badly broken, I really need to look into that. The mouse is on the second item with the actual rating as tooltip. Did you consider feeds where the rating isn’t a value between 0 and 100? I have seen feeds where the maximum rating is 5, or other. 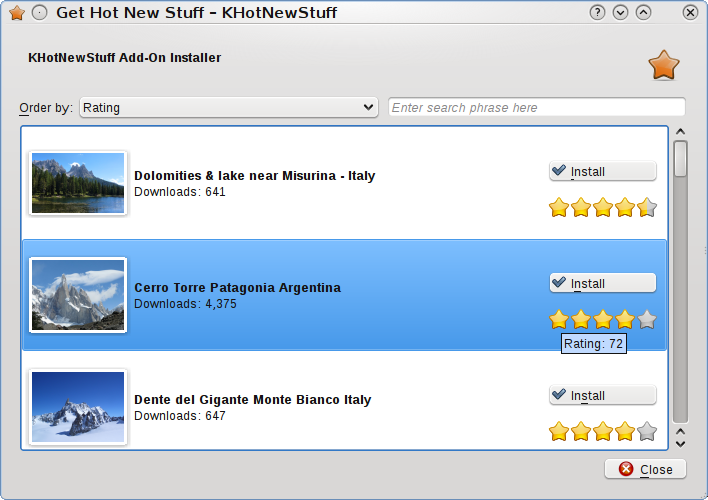 Just try “khotnewstuff4″ with all the .knsrc files KDE applications provide. @Christoph providers that have different rating schemes will simply have to convert their ratings. Now the stars are not trusthforthy if it only show 20-80 points. And the stars does not only have less meaning because of that, but because they do not flhlow the rating on the website, making the tooltip more difficult to actually use. I say very bad decision what should not be done because it is a classic way to twist correct information because some users do not care. Why should information presentation reflect what users want and not the correct information? It is a very good that someone is trying to make better GHNS but if we end up dialog what twist truth, then it is meaningless. Sorry. Also how about making two tabs, one for installed addons (where the install button is replaced by “Update” and there is a “Remove” button below it) and one for new ones with the current behaviour. To conserve screen real estate for netbooks etc, the “KHotNewStuff Add-on Installer” label can be removed and the window title changed. I like the idea of fetching more items as user scrolls down, but this raises an usability issue, as users are supposed to know that, and obviously most don’t. Me, for example, I discovered this feature by pure chance. Nice!! (oh, don’t forget to add the “%” to the tooltip rating number).